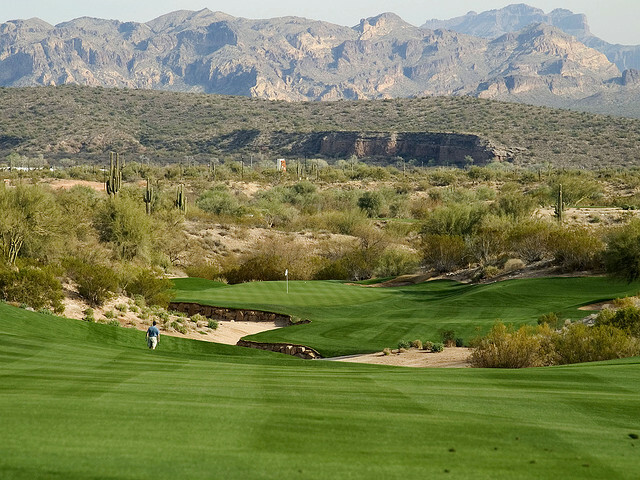 Tucson is world famous for its breathtaking golf courses. People travel from all over to experience Tucson golf vacations and get the opportunity to play on the same courses as some of the top professional golf players in the world. Are you planning to visit Tucson for some golf in the near future? Check out this all in one guide to Tucson golf vacations! The Golf Club at Dove Mountain — Home of the PGA Tour’s World Golf Championships-Accenture Match Play Championship, The Golf Club at Dove Mountain is an unrivaled golf course for quality, luxury and service. Designed by Jack Nicklaus, this 27-hole course is truly enjoyable to play and offers indescribable views of desert mountain beauty. Arizona National Golf Course Tucson – This 18-hole course was designed by Robert Trent Jones Jr. in 1996. The course is located in the foothills of the Santa Catalina Mountains and offers players spectacular scenery, including panoramic mountain vistas, forests of giant saguaros, and the rare beauty of nine natural springs. Hilton El Conquistador Golf & Tennis Resort – The Hilton offers 3 championship courses featuring 45 challenging holes of golf on this stunning property, making it the largest golf resort in Southern Arizona. They also offer golf lessons for the less experienced players, along with all the other expected amenities such as a golf shop, dining, and locker rooms. Heritage Highlands Golf Course at Marana — Designed by Arthur Hills, the 18-hole Heritage Highlands golf course opened in 1997 and offers players a fun but challenging game. The property also features a practice range and practice putting greens so you can warm up before tee time. Forty Niner Country Club Golf Course — Forty Niner Country Club, a William Francis Bell-designed classic, is located on the eastern side of Tucson. The course is designed for golfers of all skill levels and offers a traditional layout with gently rolling terrain which allows players the option to walk the course. Situated between the Catalina and Rincon Mountains, the course hugs a wooded riverbed with fairways lined by lush trees and native desert shrubbery. The 18-hole golf course was recently renovated and provides a solid challenge for all players. So the next time you want to get out there and play some golf, check out one of these top golf courses in Tucson, AZ. You won’t be disappointed!